Dunsborough beach near accommodation at Dunsborough town in the Margaret River wine region of Western Australia. 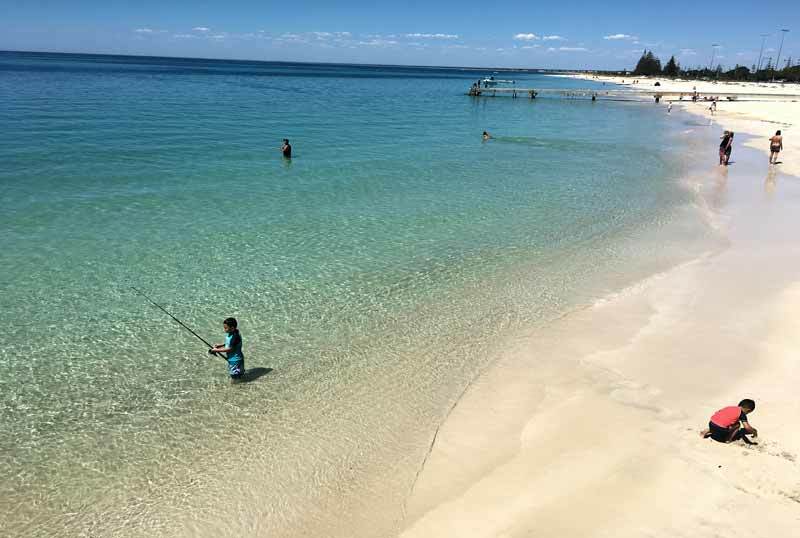 Dunsborough beach is a beautiful child safe, family friendly, white sand sheltered beach on Geographe Bay. Luxury holiday rental accommodation near Dunsborough Beach is so close to the beach that tourists can step out of the door and right onto the beach. This is possible because the big waves which the Margaret River region are famous for, don’t wrap this far round northern Cape Naturaliste. The calm beach waters and a very gradual beach slope make the beach a perfect place for children to play. Sandbars are exposed at low tide in front of the Beach House at Dunsborough Beach, when you can explore or even play beach cricket.